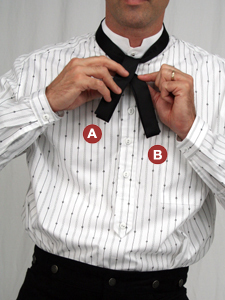 Hang the tie across the back of the neck, with equal length ends. 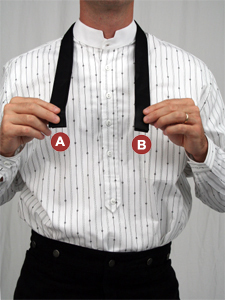 We’ve labeled the ends A and B for clarity. Cross the one side over the other. In this instance, A crosses in front of B. 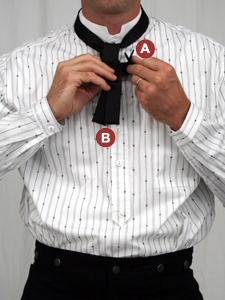 Tie a simple knot, tucking A behind the neck loop. 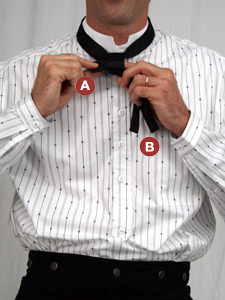 Be sure this is a reasonably snug knot, as its location will determine where the final knot lies. 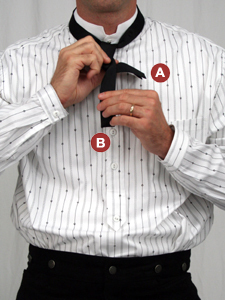 Cross A back over B, pulling B to the other side. 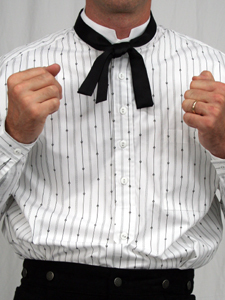 The portion of A that’s at the center will be the visible portion of the final knot. 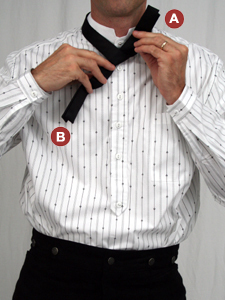 Hold B straight down, and pull A back behind B. Take the end of A and feed it back through the loop created in steps 4 and 5. You may need to switch hands. Pull the end of A carefully through the knot. You’re almost done! 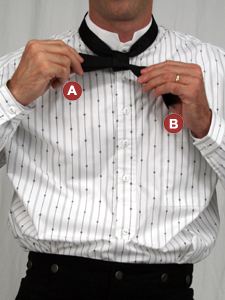 Carefully pull A and B to get the ends to roughly the same length. You may want to smooth out the front of the knot before pulling it tight. Snug up the knot to your liking. Practice until you can consistently achieve the style of knot you like.